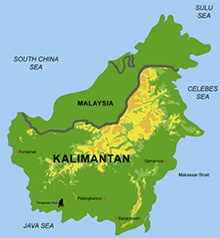 Kalteng Consultants is executing research projects by remote sensing and Geographical Information System (GIS) techniques to investigate the evolution and the economic potential of the resources in Central Kalimantan, Indonesia. By multi-spectral and multi-temporal image analysis we evaluate peatlands, the environmental importance of tropical forest and the agricultural potential as well as wildlife conservation aspects. Central Kalimantan has approximately 20% of tropical peatlands with peat swamp forests which are under danger by heavy clearing of the forest and by strong fires in the opened peatlands during dry season. We get good information about this area by satellite images and by aerial photos taken from planes. Kalteng Consultants has been working in the Indonesian Province of Central Kalimantan since 1995. At the beginning small projects were accomplished in cooperation with the German GTZ, the British ODA (now DFID), and the German Helicopter company Eurocopter Deutschland GmbH. As output students have written theses and papers have been published. Small projects were done in mining and oil exploration of Central Kalimantan.Kalteng Consultants has an office in Central Kalimantan since 2001 (Jalan Tjilik Riwut km 36, No.33, Rungan Sari, Sei Gohong, Palangkaraya, Central Kalimantan, 73225, Indonesia) and is represented by Mr. Mustafa Syafrudin. Depending on project size, the company has a staff of two or three and employs students on a project basis. Kalteng Consultants is working in cooperation with experts of the University of Palangka Raya and with Wetlands International with headquarter in Wageningen, NL. 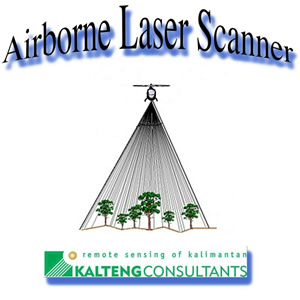 In August 2007 Kalteng Consultants carried out with Milan Geoservice a large Airborne Laser Scanner (ALS, also called LiDAR-Scanning) campaign in Central Kalimantan for the Central Kalimantan Peatland Project (CKPP) contracted by Wetlands International and the University of Palangka Raya in the frame of The Netherlands environmental project. The objective was to achieve precise Digital Elevation Model (DEM). Especially in Elevation the guaranteed resolution was ±0.15m and in x and y ±0.5m measured by helicopter with LiDAR equipment. This project has shown the importance of the LiDAR-technology for tropical forests and fragile peatlands. The Peat Swamp Forest (PSF) was penetrated by 3% to 5% of the Laser-beams. Precise profiles of the peat dome and single tree heights were measured and the depth of fires scars determined in 2008 and 2009. With the tree-height the above-ground biomass can be calculated for the REDD application. The topography of peatland including the hydrology has been analysed in Central Kalimantan and Ortho-Photos and Ortho-Photo-Mosaiks are available. The mature ALS-/LIDAR-technology can also be used in other provinces of Indonesia as well as in Malaysia, the Philippines and Singapore. 1. Boehm, H.-D.V., Haisch, S. and Friauf, E. (1995) Environmental Helicopter with Modular Sensor Concept: Example on Forestry Monitoring. Paper presented at the Conference on Remote Sensing and GIS, Jakarta, Indonesia June 6-8, 1995. 2. Boehm, H.-D.V. and Siegert, F. (2000) Application of remote sensing and GIS to monitor Peatland multi-temporally in Central Kalimantan. Proceedings of the International Symposium on Tropical Peatland – TROPEAT, Bogor, Indonesia, November 1999, pp 329-347. 4. Boehm, H.-D.V., Siegert, F., Limin, S.H. and Jaya, A. (2003) Land Use Change in Central Kalimantan over the Period 1991 - 2001 including Impacts of Selective and Illegal Logging, MRP Establishment and Fires. Proceedings of the International Symposium on “Land Management and Biodiversity in Southeast Asia”, Bali, Indonesia, Sept. 17-20, 2002, ISBN4-9901827-0-7, March 2003. 6. Boehm, H.-D.V. and Siegert, F. (2004) The impact of logging on land use change in Central Kalimantan, Indonesia. International Peat Journal, 12: 3 – 10. 7. Boehm, H.-D.V., Ramirez O.I. and Bustillo D. (2005) Environmental field trials and GIS image analysis in the Tangkiling district along the river Rungan in Central Kalimantan, Indonesia, held during the International Symposium in Palangka Raya 23 September 2005 and in preparation for the proceedings. 13. Grafil, L.B. (2009) M.Sc-Thesis, An Investigation of LiDAR Data Processing in Kalimantan, presented on 26.2.2009 at Hochschule für Technik Stuttgart, University of Applied Sciences. 14. Boehm, H-D.V, Liesenberg, Frank, J. (2010), Relating tree height variations to peat dome slope in Central Kalimantan, Indonesia using small-footprint airborne LiDAR data, presented during 10th Silvilaser International Conference, Freiburg, Germany, 14.-17.Sept.